Last weekend, I was in Georgia, where I spent 4 days riding mountain bikes and hanging out with a lot of cool people who also work in the industry. The significance of this trip was not only that it was a lot of fun. It was also one of my first expenses-paid “work” trips as a writer. This is huge for me. Someone somewhere thought that my opinion and perspective matters enough to buy me a plane ticket and a weekend in the mountains of Northern Georgia at Mulberry Gap Mountain Bike Getaway. The event was hosted by Maxxis Tires, with the purpose being to test out some of the new tire offerings on Pivot Cycles, who brought their demo truck and worked tirelessly to get us all set up on bikes as often as we wanted. Maxxis did a couple presentations on the latest rubber and the process of tire development, but other than that, the weekend was all about actually riding bikes, rather than just talking about them. 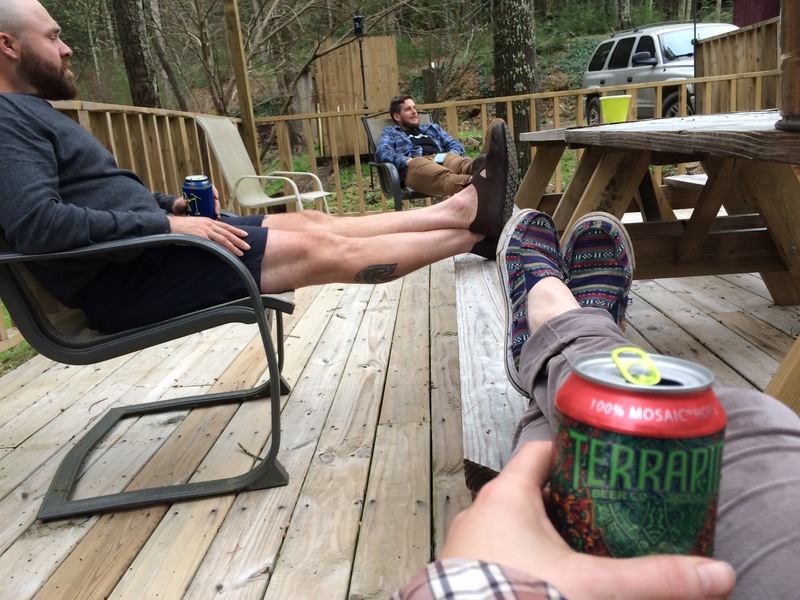 Terrapin Beer Company provided liquid and we got three hot meals a day cooked by the fine folks at Mulberry Gap. It was great. Going into it, I had no idea what to expect from the weekend, the venue, the trails, or the people. I knew a few people who would be there—Aaron, my fellow Singletracks guy, and my friends Justin and Emily, of Dirt Rag. Other than that, everyone was a new face. Luckily, we all had something in common—a love for bikes. And the weekend as a whole ended up being a lot more low-key than I expected. I arrived at the Atlanta airport late Thursday morning, then took the city’s light rail system out to meet Aaron, Jeff, and Leah for lunch. After some tacos, a quick stop at the Singletracks office and then Aaron’s house, we were off to the mountains. I drifted in and out of sleep on the way, the 3:30am wake-up beginning to take it’s toll. But when we got to Mulberry Gap, groggy as I may have been, I was eager to ride. My first ride down Pinhoti 2. Aaron and I did a short evening jaunt, a climb up gravel followed by a ripping, flowy descent on Pinhoti 2 that was over far too soon. Back at camp, I drank a couple beers and promptly passed out, with no shame. It had been a long day, and I had all weekend to party. There wasn’t a whole lot on the schedule for Friday, just a short ride in the afternoon via shuttle. While a lazy morning may have been slightly enticing, I was also only in Georgia for a few days, and if I didn’t do as much riding as I possibly could, I would definitely regret it. Aaron talked about going for a long ride—30+ miles with a ton of climbing. I wanted to do it, but I also was scared of holding people up. Two other guys that I didn’t know were coming along, and they looked like they were fast. So I decided to compromise. I’d do the first part of the ride with them, and then break off and do a shorter ride on my own back to camp. 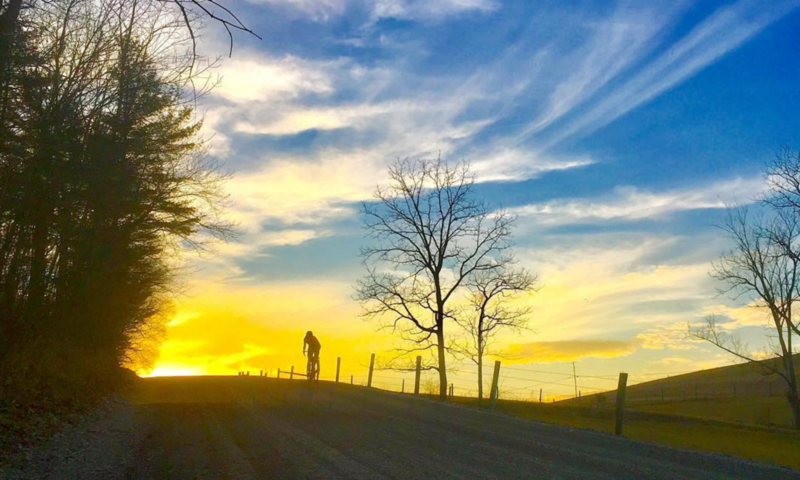 But by the time we got to where I would have turned off, I had convinced myself that I should just go ahead and do the longer ride. All it took was about 30 seconds of encouragement by the guys. I didn’t even slow down to think about it. We pedaled past my turnoff, and I was committed. Break time at the Mountaintown Overlook. Definitely can’t have those hang gliders. The beginning of the singletrack. As the gravel road continued to climb, I began to think that perhaps I had made a mistake, maybe this would be too much, maybe by the end of the ride I’d be too tired and slow. I didn’t bring much food because I hadn’t planned on being out that long. What if I bonked? What if I made a complete fool of myself and held everybody up? I quickly put my fears aside. I was in a new place, and I wanted to see as much of it as I could in the short period of time that I had available. The three guys I was with were incredibly nice and encouraging, which also made me feel 100 times better. In addition to Aaron, I was in the company of Kyle Kelley, owner of Golden Saddle Cyclery in Los Angeles, and John Watson, who runs the website The Radavist, also currently living in LA. We smiled, laughed, sweated a lot, took lots of pictures, and stopped often to take it all in. I rode the Pivot Mach 429 Trail on the long ride, and it was great! This 6-hour ride turned out to be the highlight of my weekend. It took us to beautiful vistas of the mountains beyond, rhododendron-filled gorges and stream crossings, difficult uphills and fun descents. I wrote an article for Singletracks all about this ride with more details, so I’ll link to it here once that is published. So many stream crossings on the Mountaintown Trail. Being on this ride with a couple of pro photographers, I just stood back out of their way. Snacks before the final push. Kyle and Those Purple Shoes! When we returned to camp at 5:30, we had missed lunch by hours, and promises to save some for us were unfounded. Luckily, it was almost dinnertime, and when that pulled pork was set out on the table, we gorged ourselves in sublime contentment. Afterwards, we sat outside, beers in hand, feet propped up, still basking in the glow of a great day, and the feeling of accomplishment that follows a long, hard ride. The rest of the weekend pales in comparison to the experience that I had on the Brutal Loop, but it was still a lot of fun. 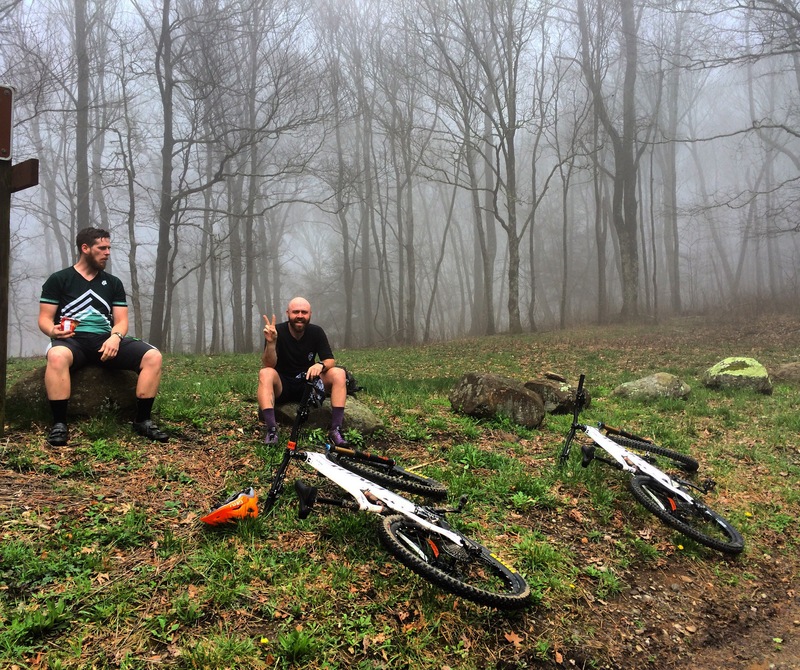 We spent Saturday shuttling Pinhoti 2 and 3, getting as many rides in on those trails as possible on as many different bikes and tire combinations as possible. On Sunday, I was feeling pretty beat and didn’t plan on riding, but talk of hitting up some different trails (Pinhoti 4 and 5) convinced me easily. Another small group of us drove even farther into the mountains for a quick ride and then a long drive back to Mulberry Gap before packing, wolfing down lunch, and piling in Aaron’s car to head back to the airport. Kyle and John came back to Atlanta with us, as our flights were only an hour apart, and we had a few drinks and cheeseburgers while killing time at a busy bar in the airport. I felt very content—I’d had a great weekend, gotten some sweet rides in, made new friends, and affirmed to myself that I am doing what I want to be doing and I’m on the right path. Maybe that sounds cheesy, but as someone who is still relatively new to all of this, that’s important. Just three years ago around this time, I had decided that I wanted to give this writing thing a shot. Until then, it was something that I just always loved to do but didn’t think would get me anywhere. So I put it on the back burner while I went through college and got a degree in something totally different (but still something I was interested in—geography). Then I decided to start posting on this blog regularly. Just shy of two years later, I applied for the gig with Singletracks on a whim because a friend of mine (thanks, John Rader!) told me that he read that they were hiring editorial staff. I was 100% shocked when they said they wanted me on their team, so shocked that it took me a few days to respond. But I did. And now, one year after that, I got to go to Georgia, and experience all of this. Hopefully it’s just the beginning. Congratulations- you have arrived with the industry inviting you to an all expense paid gig. I never made it that far with my blog and stopped posting about a year ago. But I still have about 176 posts out there and even had a coffee table book made from the blog. But you took it the further step and it looks like you are on your way. Congrats!!! By the way- I ride with Emily and Justin on Thursday nights here in Pittsburgh. Thank you, Pat! And thanks for continuing to follow my blog, even though you stopped posting. Also, the coffee table book idea is neat! Next PostNext Smurfing Black Mo.